Help us Tank our LEMON so that no one else ends up with it! That's right, we are so sick of begging Fiat Chrysler Australia and the dealer to replace our Lemon, WE ARE GOING TO DRIVE A 52 TONNE ARMY TANK RIGHT OVER IT! Little did we know what kind of nightmare we were entering ourselves into. After 2 years & 3 months our problems began. Everything that has happened since then has sent our lives into turmoil & we have had enough! Fiat Chrysler has refused us on many occasions to help & we are now ready to TANK our ride! I know this sounds a little crazy & there are going to be people out there that don't understand. We will possibly be labelled 'cuckoo' by some. However our journey with this car is real & the effects it has had on our lives & family has been huge. Everyone who is close to us knows & has seen the craziness this car has brought to our lives. After five years, this car is now worth $0. We could trade it in for possibly $8000, but who is going to buy our problems? Getting out of the house on a normal day with 4 children is a challenge (one we love), but a challenge non the less, let alone the issues we keep experiencing with this car. The amount of outings we were late for or missed out on. The stress of not being able to get to our destination, the breakdowns on dangerous highways & the hours & days spent trying to reason with a company that only seems to care about profit and not the quality of customer satisfaction of their products. This car has stolen moments from our lives for three years now & we are putting an end to it. We are not a minority & it is due time something is done about this & that companies like Fiat Chrysler are held accountable for the lemons they sell. After three years, we are not going to put our lives on hold any more. FCA have confirmed (in writing) that they’re not willing to help, so the only other option is to trade it in and pass on our problems to someone else, but why should we be forced to allow this lemon to impact another family? So.....We will be arranging for a Tank to destroy our lemon! There will be other forms of destruction prior to the main event also, so maybe you could be one of the lucky people to have a go at our lemon?? Our ultimate objective here is to help ensure Fiat Chrysler don't do this to anyone else, but also to stand up against companies like theirs that have no regard for their customers & their real problems. Eventually they will be accountable through people like us, Ashton Woods & Teg Sethi standing up to them. However, we are hoping to at least cover what we still owe on our lemon, after all we do have four children to get from A to B & day jobs of our own, hence the Go Fund Me campaign. Our goal of $15,000 will cover what we owe on our lemon, anything above that will help towards costs involved with the event & promoting the cause. Please help if you can. Below is a link to the timeline of everything that has occured on our Dodge Journey journey, we have included our service history also. We owe money on this vehcile, so we can't do this without your help. The only other option is to sell this lemon to someone else and we refuse to put another family through the same torture as us..
All the pledge levels below were created to let you get involved, this helps us and gives you AWESOME bragging rights to your mates, just imagine saying to your mates "I helped those guys run over their lemon vehicle WITH AN ARMY TANK!!!" 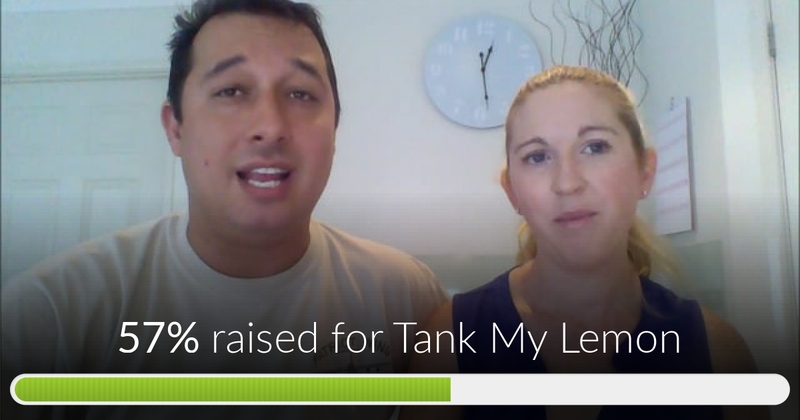 Tank My Lemon has reached 57% of its goal. Thanks to VTS IT, Alliance Leasing, Teg & so many others. Thank you all for your wonderful support so far, we are truly grateful. Hopefully this event will make a difference! Woohoo, we have launched the campaign tonight! (4th May 2016) Let's do this! I'd like to know what caused the engine cut-out on the Logan Motorway on 27-Apr-2014. If it spent 3 months in the workshop, they should have had an explanstion for it. I am actually taking FCA to court next Friday.Whilst I understand your frustration do you really think they are going to care if you destroy your property.Have you looked into all legal options? Please look into alternatives because ultimately it is you loosing out not them. Thank you so much for your support! You have assisted us in spreading the word & hopefully making a difference. Donate this amount to egg our lemon! If you are at the event you can do so yourself. Donate this amount & a lemon with your name will be placed in the car for destruction! We hope to fill the inside of the car with these lemons. Early bird special! Receive a Photo opportunity after destruction (including the tank in the back ground)! If you missed out on the early bird special, you can still get in on the action with a photo after the destruction! Donate this amount & have an arrrow with your name on it fired at our lemon by professional archers! VIP seats! Be one of only 40 people entitled to Grand stand seating followed by a look in the tank & a photo while sitting on the cannon! You are one of only 5 Major sponsors and we love you! A higher level of exposure incl. signage, mention in our marketing & posts and you'll get VIP treatment! Be our Premium Sponsor for the event & receive a Premium level of exposure from the event, plus...you get to be in the tank when it 'tanks our lemon'! Thank you for your work in raising awareness of FCAs non-compliance to the Australian consumer laws. We couldn't have achieved the outcome we did without you. Loved watching it all go ahead this morning. Well done! Well done it! you could have sold it but you had the balls to stick it to the filthy mutts.